Trickle Towers - Selectkoi - Your online koi and pondspecialist ! The SMS Alert is a GSM module with backup batteries that sends alarm messages after power failure and switching the flow switch. The undesirable failure of the circulation pump can have major consequences for fish farms and ponds. Trickle filters are the most effective biological filters. Trickle filters increase the oxygen content of pond water. 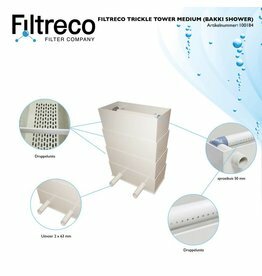 The Filtreco Trickle Tower Medium move effectively harmful, dissolved wastes (such as proteins, ammonium, nitrite, etc.) into the pond to harmless compounds. The filter contains 100 liters of Crystal Bio and is suitable as a main filter for koi and ornamental ponds, stock tanks and quarantine tanks. 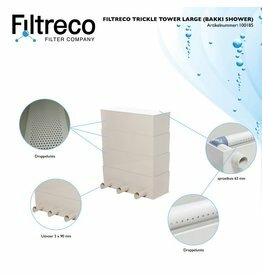 The Filtreco Trickle Tower Large sets effectively harmful, dissolved wastes (such as proteins, ammonium, nitrite, etc.) into the pond to harmless compounds. Filter Strainer. contains 50 liters of Crystal Bio and a 300 micron filter and is suitable as a main filter for koi and ornamental ponds, stock tanks and quarantine tanks. This is truly a unique filter in its class, the first trickle filter that can be used in gravity, float with an ingenious system! Trickle filters are the most effective biological filters. Trickle filters increase the oxygen content of the pond water.